I have loved everything about growing vegetables since I was a little girl tagging along behind my grandmother on the family farm in South Carolina. Today I live in a big-city condominium with no garden space at all, just a patio about the size of a handkerchief. When I moved in I knew that if I wanted to have a vegetable garden, it would have to be in containers. Something I knew absolutely nothing about. So I did what I usually do when starting something new: went to the library to find a book on the subject. And guess what – there weren’t any. This book is the result. 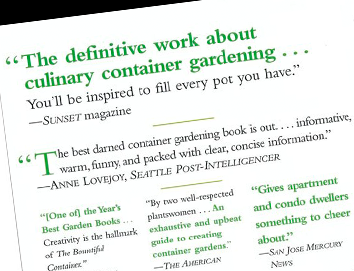 It’s full of information on growing good things to eat in a container garden, for people who do not have a traditional garden space. Maybe they live in an apartment, or a condominium, or a houseboat. Maybe their regular garden space is too shady. 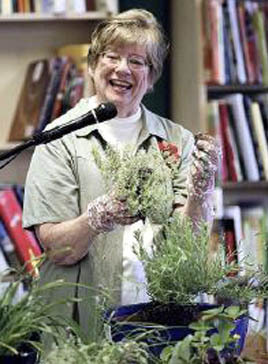 Maybe they’d love to have a small portable herb garden close to the kitchen door. 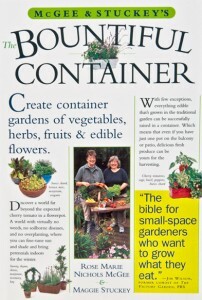 It is crammed with specifics on growing all sorts of vegetables, herbs, fruits, and edible flowers. In fact, no plant is included that is not edible. 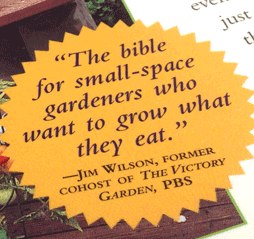 For that is the whole point: creating a beautiful, flourishing kitchen garden even when you don’t have an actual in-the-ground garden. In addition, it includes designs for 18 theme gardens. Click to look inside on amazon.com.